Here’s a startling fact: 1 million people defaulted on student loans last year. It’s hard to overestimate the impact of student debt on the economy. It makes young people delay all sorts of major life events, from buying a home to getting married and having kids. But not every college graduate bears the same debt burden, and in fact a lot has to do with the state where they graduate. We found the numbers behind our visualization in the latest annual report from The Institute for College Access & Success (TICAS), a nonprofit and nonpartisan organization focused on making higher education more affordable. They looked at the Class of 2017 broken down by the state in which they graduated college. 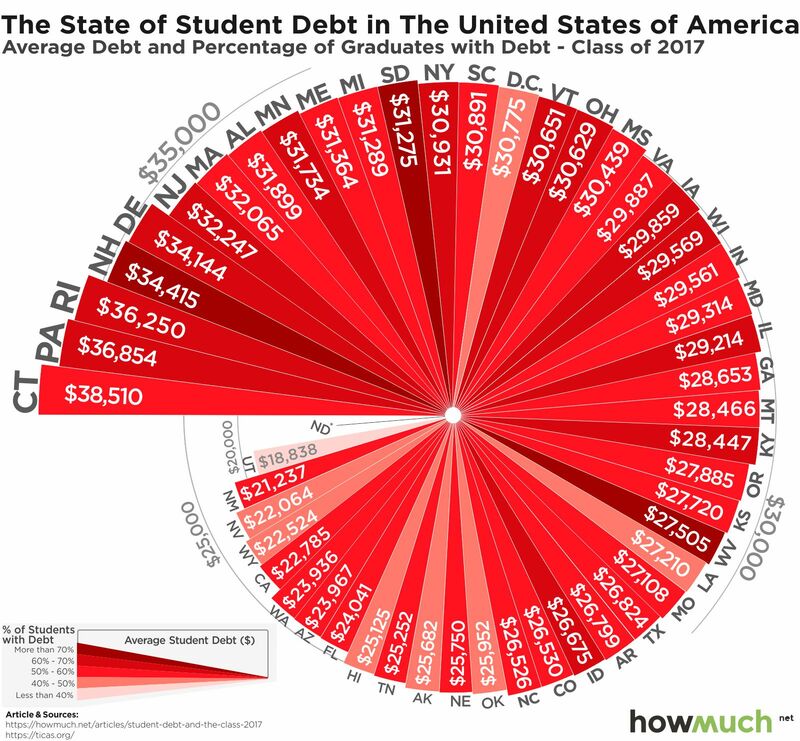 We created an exploding pie chart for each state (excluding North Dakota due to a lack of sufficient data), where the size of each slice corresponds to the average debt load, and the color represents the percentage of graduating seniors with debt. This quickly and easily reveals which states have the biggest problem in higher education affordability, and conversely which ones are a bargain. The first and most obvious trend has to do with the states at the high end of the spectrum: Connecticut, Pennsylvania, Rhode Island, New Hampshire and Rhode Island. They’re all located in the Northeast. In fact, there are only 2 states from the Deep South where average debt tops $30k, Alabama and Mississippi, and 0 are from the West Coast. This makes a certain amount of sense given how the Northeast is home to some of the oldest and most prestigious universities in the country. Now take a look at the low end of the visual. States in the West produce graduates with average debt burdens of only $19-25k, substantially less. What do these numbers mean in practical terms? Consider a $20,000 loan with a 10-year repayment plan with a fixed interest rate of 5.05%. According to a loan repayment calculator from Sallie Mae, that comes out to a monthly payment of $213. A $38,000 loan on the other hand would cost $404 each month. That’s a big difference and would drain anyone’s budget of the additional capital needed for major expenditures. The other dimension on our visual is the percentage of all graduates who carry some sort of student loan debt, regardless of how much. This is an important dynamic to consider because a relatively few number of extremely high-debt graduates can drive up the overall average, when in reality most graduates might leave with no debt whatsoever. The scary news is that in all but 8 states, 50% or more graduates are saddled with debt of some amount. New Hampshire, South Dakota and West Virginia are tied for having the greatest percentage of indebted graduates (74%). Utah takes first place as the most affordable where only 38% of students leave owing student loans. It’s not a coincidence that total debt loads are correlated with the percentage of students carrying debt. In other words, when young people start taking out loans, they usually come back for more year after year, resulting in skyrocketing numbers. The broader point behind the research study from TICAS is that average student debt loads are on a relentless upward trajectory. But not all forms of debt are bad. That’s why it’s smart to pay close attention to the schools with the biggest bang for your buck. After all, if higher education is an investment that pays for itself many times over, these debt loads represent money well spent.